Unusually I imagine, my strongest memory of Nirvana stems from Dave and Krist’s prowess as practical jokers. >> Part 3 - "I couldn’t play guitar well then and I still cannot play the guitar well now..."
>> Part 4 - "I Ran down the North End Road to Our Price and bought the LP..."
Back in ’91 I was working as a production runner for record label MCA. At the time our back offices were situated next to Geffen, the label that Nirvana were signed to. It was a usual day in the office, with normal activities being undertaken and coffee being drunk, apart from the two additional characters gracing the Geffen sofa: Krist Novoselic and Dave Grohl. They had made the trip to the building for interviews and to record clips for various radio stations. Kurt, even in those early days, never put in an appearance for press and radio days. The pair were normal guys and understandably got bored of answering the same 10 questions. Attention quickly shifted from the journalists and microphones towards distracting me from my daily duties. I’m a similar age to both Dave and Krist and of a similar height (both of them are six foot four plus) so I think they saw me as fair game. The remainder of the morning was spent getting my ears flicked by two of the pioneers of grunge. Nevermind wasn’t yet the smash success and generation-defining album it is today so it was hard for me to see those guys as much more than a pair of idiots who were bored. By lunchtime the good humoured banter had become too much so I left the office for an hour’s peace. After enjoying a sandwich in peace I headed back to the office and straight to my desk. As I sat down my chair fell apart from underneath me and I crashed to the floor. 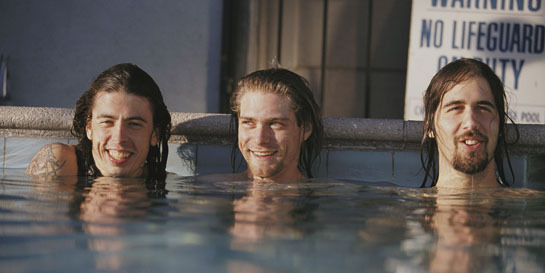 I looked up to see the gawky, long haired figures of Dave and Krist rolling around in stitches of laughter. Some weeks after being harassed by the boys from Seattle I had a pair of tickets to see the band and find out what they were doing when not irritating the employees of their label. At the last minute I gave them away to a friend, a mistake I still regret to this day. Nirvana were incredibly talented, which Dave Grohl still proves this today with Foo Fighters, and it’s amazing to be seeing the 20th anniversary taking place after my first encounter with the band many years ago.